Place the potatoes in a pot and cover with water. Cover the pot and bring to a boil; salt the water and cook the potatoes until tender, 12-15 minutes. Drain and return the potatoes to the hot pot. Meanwhile, heat the EVOO over medium heat and melt the butter into the warm oil. When the butter foams, add the leeks and wilt for 5 minutes; season with salt and pepper. Mash the potatoes with the leeks, lemon zest, soft cheese and the stock or milk. Season with salt and pepper, to taste. In Recipes-list.com we have selected the most viewed recipes from category - uncategorized . Enjoy the best recipes specially selected for you! 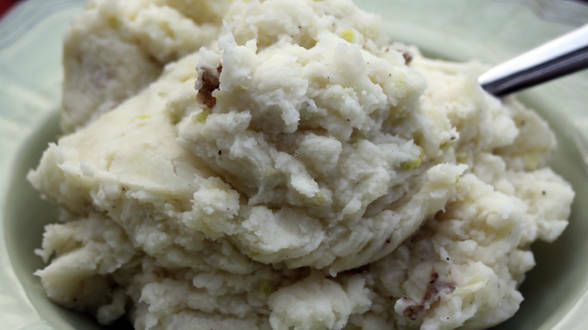 Mashed Potatoes and Leeks is the right choice that will satisfy all your claims.